Washington and its allies use the Security Council as a sound stage platform for their imperial agenda – rule of law principles ignored, the UN Charter, other international law and America’s Constitution discarded. Time and again the same or similar scenarios unfolded on the world stage, as well as in Washington and other key NATO capitals. Facts don’t matter, only a pre-planned imperial agenda, naked aggression its defining feature. The die appears cast in Syria. Regime change is Washington’s long-sought objective. Things appear heading toward something similar to US-led aggression on Afghanistan, Iraq and Libya, smashing these countries, eliminating their leadership, installing illegitimate pro-Western puppet regimes. Russia wastes time and energy demanding an independent probe into the fake April 7 Douma incident. Russian experts explaining no CW traces were found in the town, no residents ill or dead from toxic exposure, and a Kremlin press statement saying Putin stressed “the inadmissibility of provocations and speculations on” the alleged Douma incident fall on deaf ears in the West. Facts are irrelevant. On Monday, Trump signaled what’s coming, the fake/staged Douma CW incident “will be met forcefully” in a day or two, he roared. Make no mistake. This is about imperial ruthlessness! Tass cited a Wall Street Journal report, saying one or more US guided missile destroyers moving into position off the Syrian coast, not there for war games, the real thing likely coming. The fake Douma CW incident was staged to justify unjustifiable greater US-led aggression on Syria, its military forces the likely target. There you have it, another defining moment on the world staged ahead of almost certain US planned aggression – notably with lunatic fringe hawk John Bolton assuming his post as Trump’s national security advisor. Russia has only one sensible option it’s chosen not to take so far – warning Washington it won’t tolerate US aggression on Syrian forces or its government. If US-led warplanes attack Syrian positions, they’ll be downed. If US warships conduct similar operations, they’ll be targeted, damaged or sunk. That’s the only language Washington understands. All else is wasted time and energy falling on deaf ears. 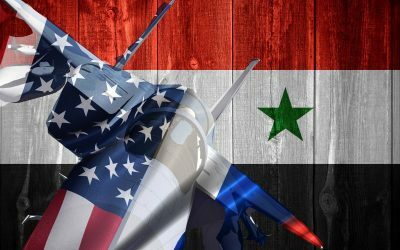 If Moscow doesn’t warn Washington in no uncertain terms, smashing Syria more than already could follow. If the Syrian Arab Republic goes, Iran is next. Russia has a choice. Challenge Washington in Syria or risk having to do it in the Islamic Republic, then its heartland – the ominous possibility of catastrophic nuclear war. “According to the Russian Ministry of Defense, their Black Sea fleet is currently on a high level combat alert in preparation for a potential attack by the US” – nothing more known at this time. Southfront reported sophisticated Russian air defense systems and “multirole” warplanes also placed on combat alert. Things could be heading toward something far more serious regionally than occurred before – much more on this as events warrant.